Try our wonderful Christmas petits fours. 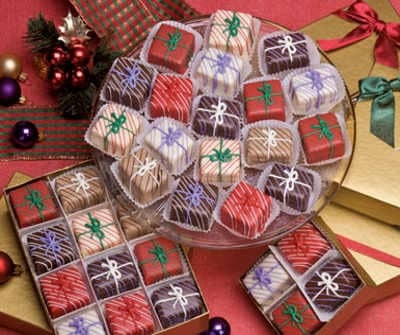 A delightful assortment of flavors are sure to add holiday cheer for all of your guests. Petits Fours also make excellent gifts for business associates and office parties. Festive packages of red and green gaily hand-decorated make these petits fours - wonderful multi-layered butter cakes - perfect for a holiday gala. This delightful assortment includes: French Espresso, Pink Peppermint, Raspberry Crème, Truffled Mint, Milk Chocolate, Raspberry Truffle and Bittersweet Cherry petits fours. How do you say "petit fours"? Actually, it's "petits fours" in the plural, "petit four" in the singular - a classic French bakery treat with a classic French pronunciation. "Petits" loses the last two letters to sound like "pet-ee"; "fours" loses the "s" to sound like "four". However, language (like baking!) is always evolving, and the formerly incorrect "petit fours" has made it into the dictionary. Who made the first petit fours? The French, during the 1800's. Petit fours became incredibly popular and spread all across the ruling classes in Europe.